This entry was posted on August 13, 2015 at 10:19 am and is filed under Documentary, History with tags 2015. You can follow any responses to this entry through the RSS 2.0 feed. You can leave a response, or trackback from your own site. Great review. Seems interesting. May see it on DVD. Wow. The review for this film didn’t exactly light up the comments section. Thanks for contributing. Magnolia Pictures is really dominating with the documentaries this year: Iris, The Wolfpack, Best of Enemies, and most recently Steve Jobs: The Man in the Machine. 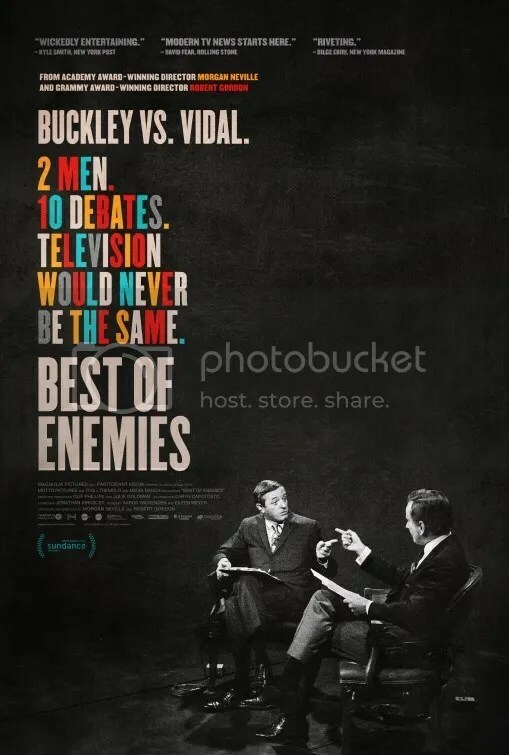 How can i obtain a copy of the Buckley/vidal debate? Best of Enemies sounds like a very even handed and very well executed documentary. I don’t think it will be my cup of tea, since I’m not big into politics or punditry. Maybe I’ll see it at some point anyway. It has a chance at a nomination for Best Documentary Feature, but I think Amy is the frontrunner at this point.